Mr. da Silva’s Workers’ Party responded defiantly to the ruling on Wednesday afternoon and called on supporters to take to the streets. 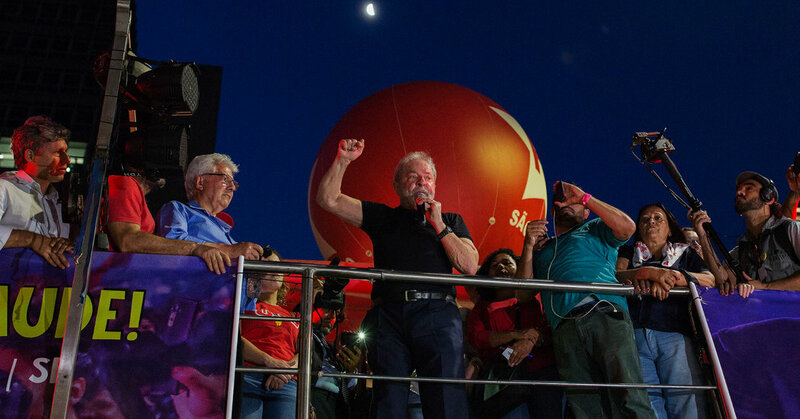 Mr. da Silva, 72, looked drained but sounded resilient when he addressed supporters in São Paulo on Wednesday night. “Mandela was sent to prison and then he came back and became president of South Africa,” a hoarse-sounding Mr. da Silva said. A woman cried during the rally to support Mr. da Silva in São Paulo. An election victory by Mr. da Silva would be a dramatic return to power for him and his party two years after the impeachment of his protégé, Dilma Rousseff. Her removal elevated Mr. Temer, of the center-right Brazilian Democratic Movement party, to the presidency. Federal Judge Sérgio Moro, the most prominent figure in the judiciary’s crackdown on political corruption, convicted Mr. da Silva in July on corruption and money laundering charges for accepting bribes from O.A.S., a major construction company, in the form of a seaside apartment that was being renovated to his liking. The judge sentenced Mr. da Silva to nearly a decade in prison, but ruled that he should remain free pending appeals. Mr. da Silva has called the conviction a miscarriage of justice orchestrated by underhanded political actors within the judiciary. Mr. da Silva’s supporters claim that he never lived in, or took ownership of, the renovated apartment at the heart of the case. They have cast doubt on the reliability of witnesses who implicated him, asserting that the witnesses testified in return for leniency in their own corruption cases. They have also noted that politicians accused of more egregious wrongdoing — including President Temer, who was recorded appearing to condone the payment of a bribe — have so far dodged accountability. The three-judge panel that considered Mr. da Silva’s appeal included two jurists appointed by the former president’s political ally, Ms. Rousseff: João Pedro Gebran Neto and Leandro Paulsen. The third judge, Victor Laus, was appointed by the former President Fernando Henrique Cardoso. Anamara Osório Silva, the president of the National Association of Prosecutors, denounced what he said were efforts to impugn the integrity of the judiciary. Security officers standing guard in Pôrto Alegre, Brazil, on Wednesday as supporters of Mr. da Silva demonstrated near the court that upheld his corruption conviction. Mr. da Silva is expected to argue before Brazil’s Superior Electoral Court and the Supreme Federal Court that disqualifying him from running in the election would subvert democracy. Political analysts and legal experts in Brazil say that ultimately the Supreme Court is likely to resolve the matter. Mr. da Silva is not expected to be jailed while appeals are pending. His backers have warned that imprisoning the former president, who governed Brazil from 2003 to 2010, would set off a severe response from Workers’ Party loyalists, known by its initials in Portuguese, P.T. Senior politicians and Brazilian scholars have warned in recent days that barring Mr. da Silva from running would further undermine faith in the country’s young democracy, which has been rocked in recent years by the impeachment of Ms. Rousseff and by the sprawling corruption inquiry known as Lava Jato, or Car Wash, that began in 2014. Mr. Temer said last week that he hoped Mr. da Silva would be allowed to run. “I think if Lula participates, it would be a democratic thing, the people will say whether they want him or not,” the president said in an interview with the Folha de São Paulo newspaper that was published on Saturday. “If he is defeated politically it is better than being defeated” in the courts, which would make him seem like a victim, the president added. Mr. da Silva is expected to travel to Ethiopia later this week for a meeting with African leaders. During a meeting with journalists last week, the former president, who rose to prominence as a union activist during Brazil’s 1964-85 military dictatorship, characterized the case against him as merely the latest form of persecution he has faced. Fans and critics of the former president took to the streets in São Paulo and Porto Alegre after the decision was announced to celebrate and denounce the ruling. Leonardo Gregory Brunnet, a 60-year-old physicist from Porto Alegre, said the prosecution of Mr. da Silva left him feeling drained.